What is economics and how to get a better grasp at this area of knowledge? That’s the big question some student initiatives try to answer in Germany. Economics students all around the country question the way economics is taught at university. Indeed, almost all the lectures take a neo-classical approach, leaving aside the plurality of theories which appeared during the last decades. The movement started in 2003 in Germany with a working group followed by the creation of a pluralist economics association in 2007, whose name was changed into “Netzwerk Plurale Ökonomik” in 2012.
oikos Leipzig has been part of this movement for several years now, through the working group AK Plurale Ökonomik. AK Plurale Ökonomik is an independent group which not only organizes biweekly reading circles to talk about recent research on that subject, but also events at university with distinguished guests. The latter are highly successful among students and beyond. The working group also tackles the issue of the lack of input of actual topics in the teaching model, like the euro and financial crisis, the growing income and wealth inequalities or even the degrowth-movement. In May 2014, a similar community was created with active members all around the world: ISIPE, International Student Initiative for Pluralism in Economics. oikos Leipzig is also part of it and participated in the global action day #2 on the 2nd of May. This event is a way to show the world that students care about getting other views in economics. 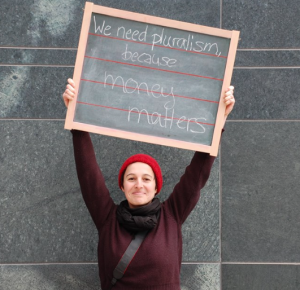 Therefore, the AK Plurale Ökonomik decided to take pictures of students holding a placard with the sentence: “We need pluralism, because…”. Everyone was encouraged to say why pluralism in economics is important to her / him. You can see the pictures on the oikos facebook website. Do you want to know more about the Netzwerk Plurale Ökonomik or about ISIPE? You can visit their websites and take look at the open letter of ISIPE.